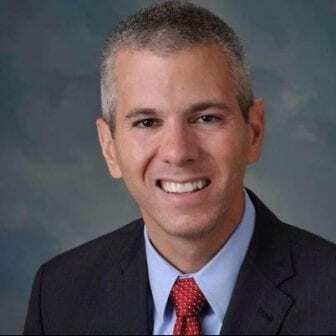 SYRACUSE, NY (WRVO) – Freshman Rep. Anthony Brindisi (D-Utica) is setting a moderate tone as he settles into his first year in Congress, joining a coalition of fellow Democrats called the Blue Dogs. He is one of the co-chairs of the group that describes itself as fiscally conservative while supporting a strong national defense and bipartisanship. The Blue Dogs have been around since the 90s, creating a unified voice for representatives in more conservative districts after Democrats lost the house to Republicans. Its membership dwindled to just over a dozen after the 2012 elections. But it is on the rebound, with 27 members joining after last November’s election, including 22nd District Congressman Anthony Brindisi. “The Blue Dog coalition, which I have the honor of co-chairing, is a coalition of Democrats who advocate for a strong national defense and fiscal responsibility,” Brindisi said. Brindisi said Blue Dogs have been advocating more moderate legislation, like a no-budget, no-pay bill that takes paychecks away from lawmakers if they cannot pass a budget. And it means working with moderate Republicans, like Syracuse area Congressman Republican John Katko. The two sat together at the State of the Union speech in a show of unity. The last Democrat to represent the district that stretches from Utica to Binghamton, Micheal Arcuri, was also a Blue Dog. Brindisi said despite the attention the more liberal wing of the party is getting these days, it is moderate to conservative districts like his that turned the house blue on election day. Brindisi said this coalition, made up of 27 members, is interested in moving legislation ahead through compromise and working with moderate Republicans.